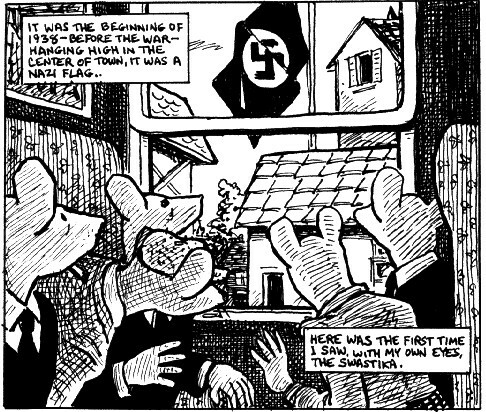 Maus, were simple super-hero children’s books. What McCloud has taught me is that they are in fact the complete opposite. I think comics, like any other art forms, can be consumed by everyone, despite age. There are children’s comics and adult comics, and I think the stigmas attached to comics as a whole are limiting people’s literary experiences. Now when reading McCloud’s book it was the same as reading Maus, at the end of each page there is a definite and obvious break. It’s sort of a chapter within a chapter, and the pause helps me take in what I’ve just seen/read. When reading Eroyn Franklin’s web comics, it was a completely different experience. Unlike Understanding Comics they are short and sweet. There is no break between scenes other than the small spaces between the frames. I also found it interesting that there are no variations in Frame size. In print comics, there are always big images and small images, however these web comics were all small square pictures telling a short story. I think if I were to make a comic book I would definitely make it in print. I think there is something about variation in frames that really helps immerse the reader. For instance, on page 10 of Understanding Comics, the entire page is a single Frame showing Scott McCloud standing in front of Egyptian hieroglyphs. Using an online medium it would be impossible to recreate this. One of the most interesting things I got out of reading Understanding Comics is when he explains the difference between animation and comics. While they would seem to be essentially the same, McCloud points out that comics are the result of images being juxtaposed upon each other in order to create movement and scene. I think it’s very interesting to think of comics in this way.